I’m not a blogger, a jogger nor do I twitter, or book my face. The social media is not my domain, but when I’m annoyed, or gratified with editorials or articles that appear in newspapers or magazines, I write a letter to the editor. In May, the weekend Magazine section of the Jerusalem Post featured an article by Seth Frantzman titled: Forgotten History, an informative piece relating to the history of the Western Wall whereby Frantzman quotes Knesset Member Dov Lipman in a discussion in the Knesset. Isi Liebler, a popular blogger, wrote an article about Religious Tolerance and Mutual Respect and he too brought up the same point, that men and women can be viewed at the Kotel together, without a divider, in all the early twentieth century pictures. A popular Israeli radio commentator spoke about the same phenomenon, and that was enough to trigger my letter of response to Frantzman’s article. Forgotten History, as featured in the Jerusalem Post, was a good reminder of the past but regrettably, some historical facts were omitted. Those like MK Lipman who wonder why men and women are pictured together without a mechitza, have forgotten history. They have forgotten when, and where the divider was born, and why it does not appear in those old photos. The Sanctuary was built with an ezrat nashim, a separate area for women. Sacrifices were offered at the Sanctuary and after the destruction, animal sacrifice was replaced with prayer time, held in small or large quarters, with areas for women to emulate Temple custom. The Western Wall, the single remaining remnant of the Temple was not in our hands, not under Jewish sovereignty. Throughout the ages foreign rulers applied regulations as to what they permitted along the narrow alley below the Wall. Dividers were forbidden, and most often, prayer too. It is wise to remember that the Kotel is now in our hands. It is neither an amphitheater nor a circus, nor an ordinary street, and age-old Jewish customs should be respected. The area begs to be a peaceful place of prayer, with traditions valued as in days of yore. When I sent the above observation to Isi Liebler he answered immediately. Thanks. That may be so. Nevertheless, for hundreds of years the Kotel served as a shrine for private prayer and meditation rather than exclusively as a Bet Knesset. Do the Lieblers and Lipmans prefer to have the Kotel returned to pre-67 condition? Is that the solution, Moslem sovereignty over the narrow street at the Wall so that the area can operate as a place for a dozen Jews, men and women, to mingle and meditate? Should we turn the clock back to foreign rules and regulations? The Six Day War brought about the most stunning miraculous victory for Israel, and changed political and spiritual facts on the ground. It reunited Jerusalem and opened the area at the Kotel to hundreds of thousands of people to pray, visit, and meditate daily. After over two thousand years of foreign rule, the Temple Mount and the Kotel were returned to our hands. A mechitza, a divider was necessary to implement traditional prayer service and was set up by the Ministry of Religious Affairs immediately after the area was opened to the public in 1967. That mechitza is respected by the large majority of men and women in Israel and around the world. The traditional style at the Kotel is one of a mechitza for prayer in adherence to orthodox Jewish custom. If individuals or groups find it tasteless they can pray or eat at home, or wherever their palate is sated. Not everyone must, or can, enjoy their portion of kugel in an authentic Yerushalmi setting. 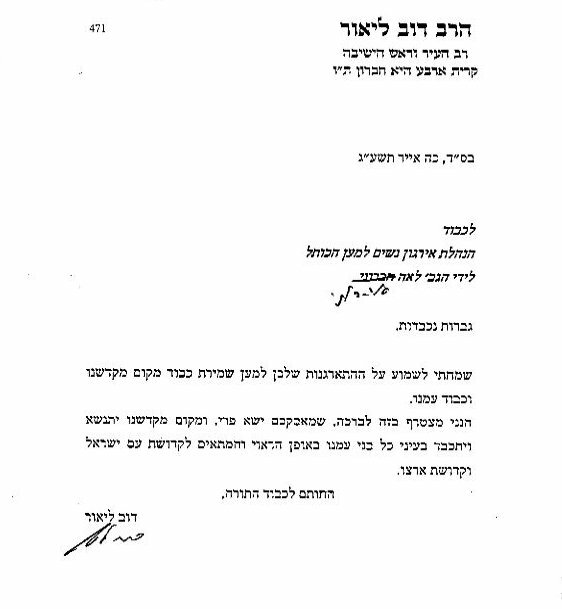 With all due respect to Jewish Agency head Natan Sharansky, the Kotel does not belong to everyone. The Kotel is a historic religious Jewish site, and it should be dealt with according to tradition. Conventional prayer service as practiced in orthodox houses of prayer cannot satisfy all the people, all the time. Sufficient if it satisfies most people most of the time. If fifty Jews for Jesus want to hold a Sunday morning prayer service at the Wall, must that also be tolerated? Yes, they may be Jews, but there are red lines, there are traditional rules and the Rabbi of the Kotel draws the red lines, he is in charge, and his rulings should be upheld. For the uninformed, religious prayer custom at the Kotel did not change after 1967. Former tradition was reinstated. The women who are disturbing the peace today are doing so first with tallit and tefillin, to be followed by removal of the divider. The egalitarian service they desire, and the means to achieving it, is a disservice to the entire House of Israel, and their behavior at the Kotel can, G-d forbid, bring the House down. Faigie Heiman is an accomplished short-story and essay writer and the author of a popular memoir titled Girl For Sale. Born and raised in Brooklyn she made Aliya and lives in Jerusalem since 1960. Just remember: “Jews for Jesus” is a red herring. They are not recognized as Jews by any mainstream movement of Judaism. 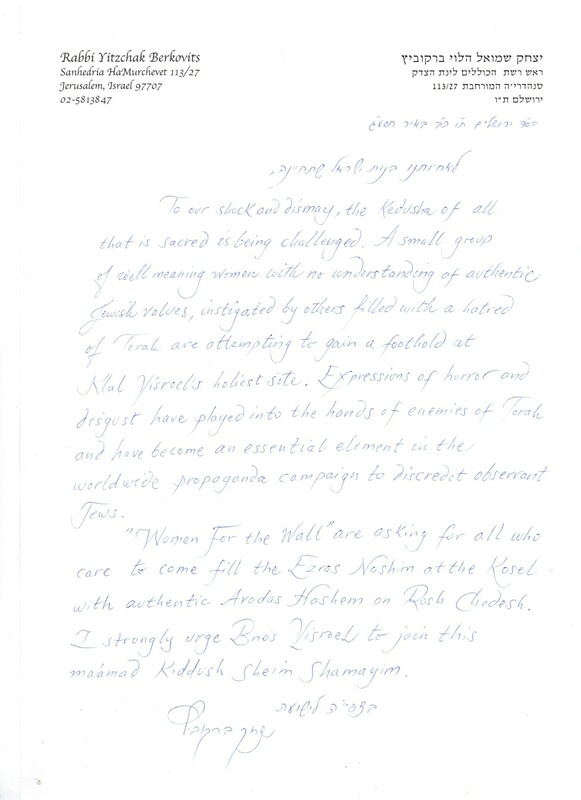 Note that the Women of the Wall is not calling for the removal of the mechitza. I beg to differ, Jon. Anat Hoffman, head of WoW has called for that exactly on her speaking tour on behalf of WoW.